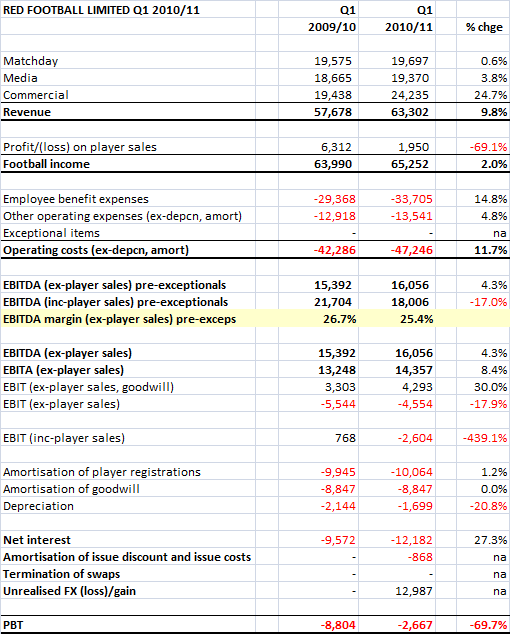 Red Football Limited's Q1 results (3 months to 30th September 2010) were published today. They are available on www.mufplc.com. No information was given on the reported PIK redemption other than confirmation that no dividend has been paid out of the club. A Glazer family spokesman has told the BBC that no equity stake has been sold in the club. We are thus left with a total mystery as to where the money to redeem the PIKs has come from. A refinancing would seem the most likely route, but neither the club nor the Glazers seem minded to tell us anything. These were not exciting figures and mainly confirm the trends we saw in the full year results. Matchday income was up very marginally (0.6%). This reflects one fewer home game this quarter (drawn away in the Carling Cup), offset by higher tour income. Tour income is not split out separately from home games but a back of the envelope calculation suggests it is around £6m. The club is still generally selling out home games (Wolves in the Carling Cup being the exception), but it is clearly a struggle with local newspaper adverts for home games now a common feature. 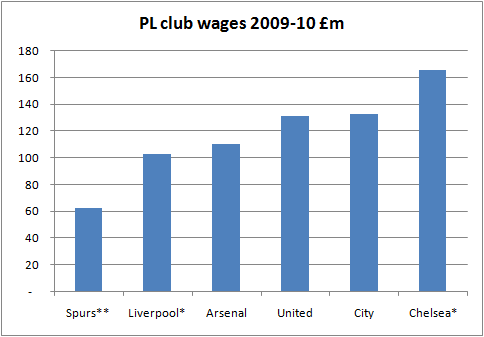 In media income, United benefitted from the new three year PL deal which began this season. Whilst domestic rights growth was low, the overseas rights bonanza added around £1.5m. This offset the £1.6m fall in CL media income (the "market pool" element) due to United coming second in the PL last season. Commercial revenue was again the star rising 25%. This is the first quarter to included the Aon deal (worth around £1.5m more per quarter, although this extra cash was pre-paid in 2009). The growth on last year also reflects all the smaller deals done during last season (Concha Y Toro, Smirnoff, Turkish Airlines etc). In total, revenue rose 9.8%. 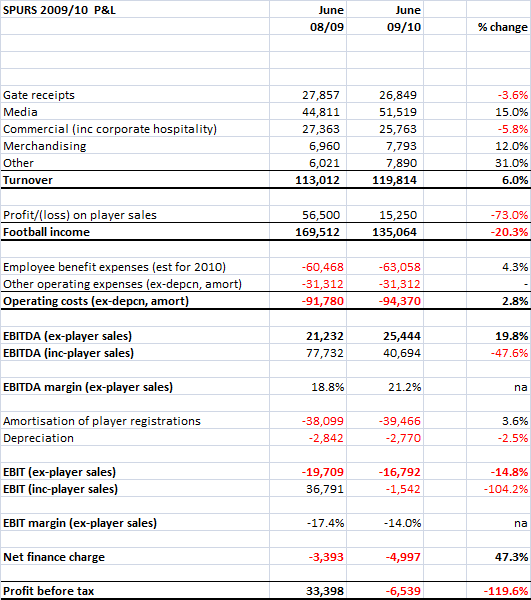 The profit on player sales was only £2m vs. £6m last year as Possebon, Cathcart and Tosic left. On the cost side, I have to say the rise in salaries at 14.8% is totally staggering. Last year wages rose 7% so this doubling reflects a huge acceleration in wage increases. Note, these figures do not include Rooney's pay rise! 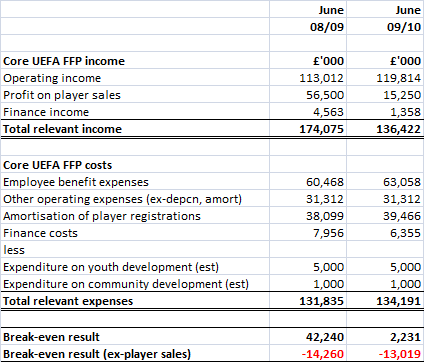 Salary inflation shows no sign of slowing down in the run up to UEFA's Financial Fair Play rules coming in. Other costs rose 5% year on year. In total, costs rose 12%, ahead of the rate of growth in revenue. The interest charge was £12.2m. This is one quarter of the bond interest paid annually. Actual cash interest paid was £22.7m (the bond payments are in February and August) and probably includes c. £1.6m in swap losses. The £26m of swop losses not paid last year are being paid over the next four years but we do not have the exact payment dates. Gross debt (including MUTV and the Alderley mortgage) is reported at £509.4m (down from £522m at the year end). This fall is due to the strengthening of £ vs. the US$ during the quarter. The gross debt figure does not include the unamortised issue discount and financing fees of c. £22m. Total debt repayable is therefore c. £531m. The cash balance fell £12.1m since 30th June to £151.7m. This seasonal fall is normal for the club. There was an explained inflow from working capital of £6.6m which limited the fall in cash. These figures show United running very hard to keep up with quite extraordinary wage pressures. So far the commercial growth is delivering, which is essential as there is little growth in Matchday or Media to compensate. These figures cast no light on the refinancing or redemption of the PIKs. The silence from the Glazer family and the club on this issue is a disgrace. If all is good, tell us the details please. Following the news that the Glazers are redeeming the PIKs, this is now only of academic interest, but I thought it might be useful for readers to see the full terms and conditions of the PIKs. I was supplied these documents a few weeks ago in confidence by a bond market participant who is now happy for them to be published. This confirms the interest rate (14.25% rising to 16.25% if debt to EBITDA exceeds 5x), the redemption terms and other details of the loans. It shows that the PIKs can be repaid at any point with at least five business days notice. It also shows that there are no penalties for early repayment after the first two years. In other words, there is no structural reason why the PIKs could not be repaid without penalty since 16th August 2008. The issue has always been availability of funds. This confirms that the PIKs are secured on 100% of the equity of Red Football Limited. As I wrote yesterday, we are left with many questions about the future financial structure of the Red Football group. I think it is time the Glazers and their employees answered some questions on all this. This evening Bloomberg's Tariq Panja has broken a story that Red Football Joint Venture Ltd (the parent company that issued the famous Payment In Kind loans) is to redeem all £220m of the PIKs on 22nd November. Perhaps more importantly, Bloomberg report that none of the funds to redeem the PIKs will come from Manchester United. As has been well documented, under the terms of the bond issue, the Glazers can take £95m from the club whenever they wish. The fact that they are NOT using this dividend entitlement to repay the PIKs raises the obvious question; where is this money coming from? The PIKs are being refinanced with a new form of debt, secured (as the PIKs are) on RFJV's shares in Red Football Ltd. If this was the case, it would be reasonable to suppose that the interest rate on this new debt was lower than the 16.25% currently being paid on the PIKs. The question would remain as to how this debt would be repaid in the long-term and whether the burden of this repayment would fall on the football club. The Glazers have sold a stake in Red Football Limited to a third party outside investor and are using all or some of the proceeds to repay the PIKs. The consequences of this would obviously be hugely uncertain. Who could this investor be? What stake would they own? How would their ownership impact the running of the club? The Glazers have secured significant sums from another source, perhaps by selling assets. I find this incredibly unlikely as the only asset valuable enough is the Tampa Bay Buccaneers. The fact that redemption notices for the PIKs have already been issued suggests the funding is already in place which does not tally with a sale of the NFL franchise. As someone who has repeatedly and vehemently stated that the club's money would be used to repay the PIKs, I can only eat humble pie at this point. Another source has clearly been found and that means I was wrong. I do believe however that until we have concrete answers about the source of this £220m it is best to reserve judgement about what this means for United. Tomorrow (Tuesday 16th November) Red Football Limited announces its results for the three months to September 30th. These results may cast more light on what is going on, but there is a good chance that no further information will be forthcoming as the PIKs are held by the parent company that is not reporting its figures. I will be blogging about the figures tomorrow.